Our wineries here in Clinton County, Illinois, always seem to be hosting a bevy of entertaining events, and this Spring is no different. From tasty brunches to weekend music, here’s a rundown of what’s going on. Looking for something fun to do some weekend? Enjoy a relaxing Saturday or Sunday afternoon at Roundhouse Wine Company where you can sip wine—Golden Spike Apple, for instance—and enjoy live music. The winery offers a nice snacking menu with pizza, cheeses and sausage, and soft pretzel with cheese. Check the winery’s Facebook page for special evening events too. Friday – Sunday, 12:00 p.m. – 6:00 p.m.; music, 3:00 p.m. – 6:00 p.m.
Hidden Lake Winery keeps a full calendar of events from wine tastings to weekend music and special events. Sunday, April 1, 2018, the winery is hosting a special Easter Brunch for the whole family. At other times of the week, you can stop by for wine tastings of some of its 15 varieties. A nice tasting bar menu is also available daily. Winery Hours: Monday – Wednesday, 11:00 a.m. – 5:00 .m. ; Thursday, 11:00 a.m. – 9:00 p.m.; Friday – Saturday, 11:00 a.m. – Midnight; Sunday, 11:00 a.m. – 7:00 p.m.
There’s always something fun going on Bretz Wildlife Lodge and Winery, including live music every Friday and Saturday evenings and Sunday afternoon. Three brunches highlight the spring calendar: Easter Champagne Brunch, Mother’s Day Champagne Brunch, and a special Father’s Day Brunch. Stop by the Kudu Room any day to sample one of Bretz Winery’s red, white, blush, or fruit wines. Live music Friday – Saturday, 8:30 p.m. – 12:30 p.m.; Sunday, 2:00 p.m. – 6:00 p.m.
Easter Champagne Brunch, April 1, 2018; 9:00 a.m. – 1:00 p.m.
Mother’s Day Champagne Brunch, May 13, 2018; 9:00 a.m. – 1:00 p.m.
Father’s Day Brunch, June 17, 2018; 9:00 a.m. – 1:00 p.m. While Twelve Oaks Vineyard in Carlyle doesn’t have any special events on its calendar at this time, it is open for tastings on the weekend. The winery now offers six different varietals, including a crisp and fruity white Vignoles and a rich, full-bodied red Norton. The team at Crooked Creek Winery also offers weekend wine tastings, a good chance to try their five wines, including popular Barn Dance, a sweet and fruity red. While no special events are currently scheduled, you’ll find any future events listed on the winery’s Facebook page. Whether wining, dining, or just out for fun, you’ll find it all here in Clinton County! 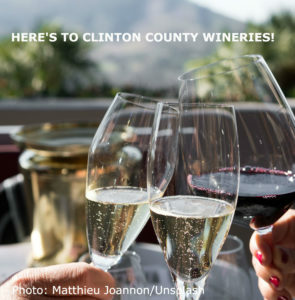 This entry was posted in Events, Food & Drink, Local Businesses, Winery and tagged Clinton County attractions, Clinton County event, Wineries by admin. Bookmark the permalink.